Henry, the second son of Henry VII, was born in Greenwich, in 1491. 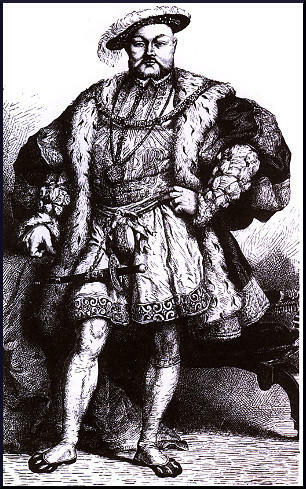 Henry, who had become king in 1485, was determined that the Tudor family should rule England and Wales for a long time. To do this he needed to protect himself from those who had the power to overthrow him. His first step was to marry Elizabeth of York, a member of Richard Ill's family. Henry was also worried that England might be invaded by Spain, the most powerful country in Europe. In 1488 Henry signed a treaty with King Ferdinand of Spain. By this treaty Henry VII agreed that his eldest son, Arthur, should marry King Ferdinand's daughter, Katherine of Aragon. On 14 November 1501, Arthur, who was just fifteen, married Catherine at St Paul's Cathedral in London. Five months later Arthur died of tuberculosis. Henry VII was keen that England and Spain should remain united and arranged for his other surviving son. Henry, to marry Catherine. At that time, Christians believed it was wrong for a man to marry his brother's wife. Henry VII therefore had to gain special permission from the Pope before the marriage could go ahead. In 1509 Henry VII died. His son Henry now became king of England. Henry VIII was only seventeen but the English people appeared to be happy that they had a new king. For years Henry VII had been imposing heavy taxes on the English people. One of the first things Henry VIII did when he became king was to order the execution of the two men his father had employed to organise this taxation. (Source B) In 1509 Thomas More wrote a poem to celebrate the coronation of Henry VIII. The King stands out the tallest, and his strength fits his majestic body... There is fiery power in his eyes, beauty in his face... He has immediately arrested and, imprisoned anyone who had harmed the realm. The king spent his time hunting, hawking... singing, dancing, wrestling... playing at the flute and writing songs. He (Henry VIII) is the noblest king that ever reigned over the English nation... whose virtue, learning and noble courage... has brought England freedom. The king was now overgrown with fatness... he became more and more unwieldy. He could not go up or down the stairs, unless he was raised up or let down by an engine. (Source F) Pasqualigo was the Venetian ambassador to England during the reign of Henry VIII. In 1515 he wrote a letter describing Henry VIII. He plays well on the lute and harpsichord, draws the bow with greater strength than any man in England, and jousts marvelously. Question 1. Select a source from this unit that suggests Henry's appearance changed as he got older. Question 2. Study sources B and D. According to these writers, what changes did Henry VIII make when he became king?